The Spanish American War Centennial Website! 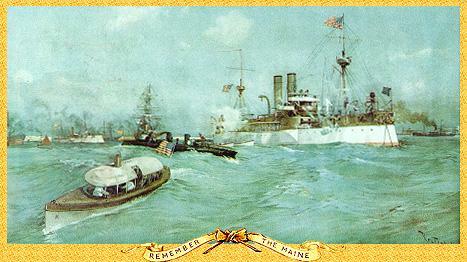 USS OLYMPIA NEEDS YOUR HELP! Click Here to Learn How You Can Get Involved! Search the entire site, using this searchbox! We had our 8,000,000th hit on 1/6/06!! It took 5 months. We had our 7,000,000th hit on 7/31/05!! It took 5 months. We had our 6,000,000th hit on 2/19/05!! It took 6 months. We had our 5,000,000th hit on 9/6/04!! It took 7 months. We had our 4,000,000th hit on 2/11/04!! It took 9 months. We had our 3,000,000th hit on 5/5/03!! It took 13 months. We had our 2,000,000th hit on 3/28/02!! It took 11 months. We had our 1,000,000th hit since we started tracking (3/24/00) on April 18, 2001!! It took 13 months!